Whip up this moreish dip for a mid-afternoon snack or simple starter to share. Ready in just 10 minutes, creamy feta is swirled with vibrant herby pesto and topped with crunchy pine nuts. Crumble the feta into a food processor. Add the soft cheese and blitz until smooth and creamy, scraping it down the sides with a spatula if necessary. If you don’t have a food processor, mash the feta well with a fork, then beat in the soft cheese using a whisk or wooden spoon. Transfer to a serving bowl and lightly swirl the pesto through the cheese. 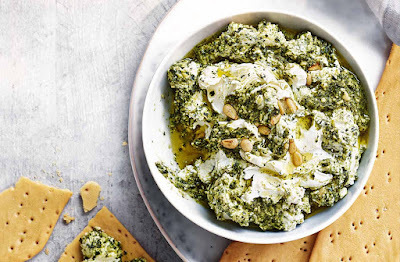 Top with a few pine nuts and serve with flatbreads or crudités for dipping, if you like. Tip: For a smart starter or canapé, spread on toast and top with semi-dried tomatoes or artichoke hearts.